The World's Most Stunning Lab-Grown Gems! Happy Friday! A bigger update this month with lots to discuss so please get comfortable, grab a drink and let’s get underway! Another weekly production record: We’re continuing to improve our weekly production and broke the record set last month, with a new record this month. Out of 7.5mm rough, but no more waiting list for 7.5mm: The bulk of our production in February was 7.5mm. As a result I’m very happy to announce that as of tonight we have 0 people on the waiting list for colorless 7.5mm! No coincidence but we’re also out of 7.5mm rough now since we’ve produced a number of them, so we won’t have any more 7.5mm restocks for another two months or so, but it was really nice to finally see one wait list drop to 0. And I’m also happy to note, we have live inventory now of 7.5mm! High demand for 9mm, Upcoming sizes include more 9mm and even 10mm! We’ve had a big jump in demand for larger (8mm, 8.5mm, 9mm) Soaring Hearts Eternity. As a result, we’ve been increasing production now of 9mm and even have some 10mm that will start production on Saturday. The 9mm sizes have sold out incredibly fast after each restock, so we are going to be very focused on the larger sizes over the next few months. The Soaring Hearts Eternity- the only diamond alternative with a faceted girdle. Thanks very much to Jonathan for the video review! Saturated Blue Amora Gem rough! We will be cutting some new rough in the next two weeks that is a much richer blue color. These will yield 8mm and the hope is these will be Fancy Intense Blue on the GIA blue diamond scale. TIGER-2 update: We’re currently cutting test stones with TIGER-2 and hope to have it fully certified and ready to move to production within the next two weeks. TIGER-3 we are hoping to finish and get into production by late April. TIGER-5 and AVC/Krupps: After reviewing our production and robot expansion plans, we have decided that we’ll be dedicating new TIGERs completing this summer to be dedicated to various cuts. Thus, TIGER-1 – TIGER-4 will be be for Soaring Hearts. TIGER-5 will be dedicated to AVC and Krupps and TIGER-6 will be dedicated to likely Cushion cuts. That’s it for this month’s update! We’ll have more updates on TIGER-2, 8-10mm Soaring Hearts production and hopefully how the first rich blue Amoras came out next month. Have a great weekend and see you end of March! The full post with all the details and more information can be found on our discussion board, here! I’ve had my Amora for a little over two years now and it is still just as amazing as the day I received it. It’s so bright and beautiful that it often catches my eye with its sparkle. I am always stunned with its beauty and whenever this happens I am reminded of my wonderful husband who got this gift for me. Now men, it has come to my attention that you are more wary of this product than women. You worry that she will be disappointed because it’s not a “real diamond,” that it isn’t good enough, or name brand. 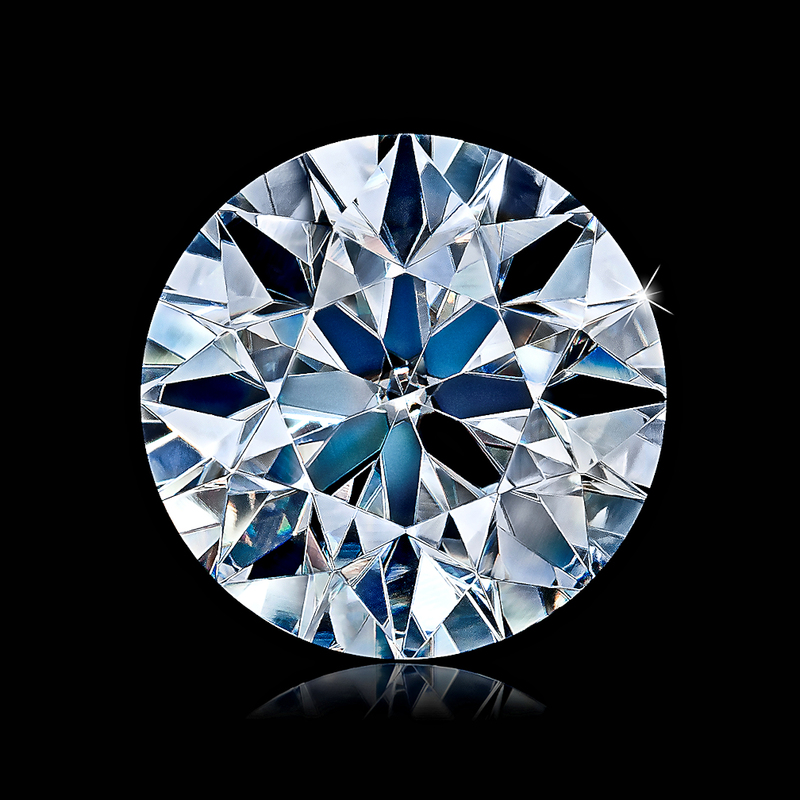 Well let me tell you that it truly is better than diamond and a few women in my life who were given diamonds tell me in secret that they think so too. I told my sister and her now husband all about this magical stone and she was thrilled. He got her a diamond anyways and now a year and a half later she still laments to me about how my ring that was less than 1/2 the cost of hers is so much better and brighter. The exact same thing happened with another girlfriend of mine. So men, when she tells you she wants an Amora it’s not because she is worried about your ability to afford a diamond or anything else. It’s because she wants something superior. We greatly appreciate this customer’s feedback, especially given that our goal with Amora is to offer something superior in every aspect. Happy Friday, Happy Belated New Year – and Happy Chinese New Year! We’re off to a flying start with record weekly production for Amora Gem so lots to discuss. Please get comfortable, grab a hot chocolate and let’s get underway! Amora Production – Weekly production records broken: I’m very pleased to start off the blog with the news that we achieved record weekly production this month! For the first time with TIGER and our v7 parts, we now have very stable and steadily increasing production, week after week. As the v7 indicates we had to go through 7 major iterations (and many minor iterations) last year to finally get to our goal of consistent, reliable production. A long and expensive trip up the mountain to get to the peak but very pleased we’ve made it. As a result, we’re steadily working down our waiting list and will be expanding, significantly, our inventory going forward. Larger size Amoras coming next month: We currently have rough for 9mm (3ct) size Soaring Hearts in laser cutting, and have a lot of 8mm rough being inspected for laser cutting currently. In addition, due to increasing demand, we will be working on adding 10mm (4ct) as a regular production size. That requires some new ‘fingers’ for TIGER to handle but those are in progress now. Fancy Blue and Fancy Green Amoras? We’ve had some interesting developments on the fancy color front, both from R&D work on color, and from growth surprises after cutting. We received a Canadian patent for “Hearts and Arrows SiC Gemstones”! This week our patent attorney informed us that Canada had granted our patent for Hearts and Arrows in SiC Gemstones. This covers not only Amora, but also moissanite and cubic moissanite. We thus have H&A patents in both Canada and Australia, and currently have two other patent applications in the US related to Hearts and Arrows and rounds as well that are in progress. Happy Chinese New Year, have a great month, and look forward to talking at the end of February! The full post with more details can be found on our discussion board, here! Amora Gem Production: Production is expanding nicely and we’re having multiple restocks per week now. Sizes have been 7mm – 8mm, (Soaring Hearts Eternity) and colors ranging from D-H color. Sky Blue Amora Gem color: A bit of a surprise, but we may have some Sky Blue Amoras this year. These will likely grade as Fancy Light Blue on the diamond scale. More details to come. New Amora Patent filing: We’ve filed for another US patent. This covers optimal fire and brilliance for SiC round gems and is the result of all the computer modeling done last Spring through Fall. “Optimal Brilliance and Fire for Round Brilliant SiC Gems”. This also makes the Soaring Hearts Eternity H&A officially patent pending, as it is covered in this latest patent filing. TIGER-1, TIGER-2 and TIGER-3 and Year End thoughts: TIGER-2 and TIGER-3 will be coming online early 2017 and that will let us triple total production. More importantly, we made it through a very difficult year transitioning to TIGER from our old robots and after tons of work, now have an excellent and robust production process that we can scale with as we grow in 2017. Believe it or not but we are on v7 parts for TIGER. I realize the many production delays were very frustrating for customers this year, but rest assured we worked 6 and 7 day weeks most of this year with the one goal of ensuring our Amora Gem H&A (now finalized with the Soaring Hearts Eternity H&A design) would be the pinnacle and ultimate H&A gem. 2017 looks incredibly bright and we are looking forward to massively increasing production and ending the wait lists in 2017! Happy New Year and see you end of January for a more detailed update! Current inventory for our Amora Gem can be found on the inventory search page, here! Happy Thanksgiving! Due to the Thanksgiving Holiday, this month’s blog update is earlier than ever as next Friday will be December, and with the Thanksgiving Holiday, Wednesday becomes the last working day of this week. A shorter update overall but lots of good news! TIGER-1 upgraded to 1.1…working flawlessly! To pick up where we left off last month, we had our v3 nanopolish parts arrive and we were just kicking off full Soaring Hearts Eternity production. Unfortunately both of the first runs then crashed out an hour and a half hour before completion due to error’s we’d never seen. The root cause turned out to be that we had 4 weeks of non-stop rain here in Seattle, and the humidity built up inside TIGER’s body and affected the electrical contacts. Thus with data being transmitted as digital spikes of voltage the moisture was disrupting the data in the commands issued, resulting in random and never before seen errors. Thus, we opted to take TIGER offline and proceed with a full electronics upgrade (with waterproof connectors) that we had been planning, along with a rebuilding of TIGER’s wrists and tuning of all it’s arms, plus a few software algorithm improvements. We also installed a fan inside TIGER and put in a de-humidifier in the lab. TIGER has thus became TIGER 1.1 and we couldn’t be happier with the results. Production for Soaring Hearts Eternity has now achieved near ‘push button’ processing and TIGER’s precision is the best it has ever been. Soaring Hearts Eternity production – excellent production flow at last: As mentioned, production for Soaring Hearts Eternity has ramped up nicely with TIGER 1.1. We had a restock of both 6.5mm/7mm and also 8mm this past week. Everything promptly sold out but we expect to continue to have record weekly production going forward. December will be 7.5mm and 8mm primarily. TIGER-2 and TIGER-3 – all parts complete. Assembly starts next week: I’m happy to note that all parts for TIGER-2 and TIGER-3 have completed machining and are now in shipping to our assembly warehouse. We’re hoping to get TIGER-2 online as early as Christmas and TIGER-3 by Valentines Day. This of course will let us triple production early in 2017, and allow us a lot more flexibility in terms of size range and eventually shapes. When a brand name means nothing… After we purchased the aforementioned de-humidifier for our lab, we then received an email about a recall notice for various de-humidifiers. What was interesting was how many ‘distinct brands’ were in fact nothing but the same Chinese made de-humidifier under the covers. As part of the recall, the US consumer govt site showed there were 53 brand names being recalled because apparently, these were all actually made by 1 single Chinese manufacturer (Midea). This included names like Honeywell, Sylvania, GE, Kenmore, etc. which you would have assumed all had their own plants and making unique, distinct products. Instead you have 1 actual maker putting 53 different brand labels on their product, so your trust in ‘brand X’ would have been misplaced since they were all being made at the same place, with the same now recalled flaw, but with a different label on the front. And hence all being recalled for the exact same problem. This is similar in fact to many of the new ‘moissanite’ brands popping up – for most of these, there’s one Chinese maker supplying, but everyone is putting their own brand name on the same product causing consumers to think there’s all kinds of new moissanite makers entering the market. For reference, we are the actual manufacturer of the Amora Gem, cut by TIGER. It’s not just a brand name slapped on the same gem everyone else has. Here’s the full recall name list of the 1 single Midea manufactured de-humidifier to show the 53 brand names with 1 actual maker. Happy Thanksgiving to all! We’ll have one more update right after Christmas to catch up on the Soaring Hearts Eternity production and TIGER-2 and T3 expansion for the last update of 2016! The full post with all the news and more details can be found on our discussion board, here! Happy Friday and Happy Halloween!! Production – not much this month…but new part for nanopolish arrived today! So we actually accomplished a ton of things under the covers but as part of all those improvements. Video review of Soaring Hearts! Jonathan (of GoodOldGold.com and also AugustVintage.com) is releasing a 4 of 5 part video review series on the Soaring Hearts Eternity. It’s quite detailed so there’s several parts to it. There are 5 total segments, 4 of which have been released. Final segment to come. Thanks very much to Jonathan for making this detailed review. AVC update: Note that while we are not going to do any fancy cuts until we are better caught up on Soaring Hearts demand, I did want to mention that the AVC has been further optimized by Jonathan after he purchased the same software we and GIA have for modeling. Thus, when we do start AVC Amora production you’ll see an even more improved AVC than before. That’s it for this month’s update! Happy Halloween, have a great month and hope to see you the end of November! The full post can be found on our discussion board, here! Happy Friday & Happy Fall! Update to the Soaring Hearts cut – Soaring Hearts Eternity: As previously discussed, the Soaring Hearts cut was optimized using the best available cut modeling software in the world. Only GIA, BTD and now Jonathan (from Good Old Gold) have the full pro version of it in the US. However, the company who makes the software has been research and have improved the modeling from mono-scopic (or one eye) to include how humans see (stereoscopic) to perfect the stereoscopic modeling. They are no longer releasing software updates but in a discussion with them they are doing the stereoscopic modeling on a private, contract basis. The Stereoscopic modeling is much more computationally expensive but accurately reflects how humans will perceive it vs. simply optimizing total light ray balance which is how all modeling has always been done. 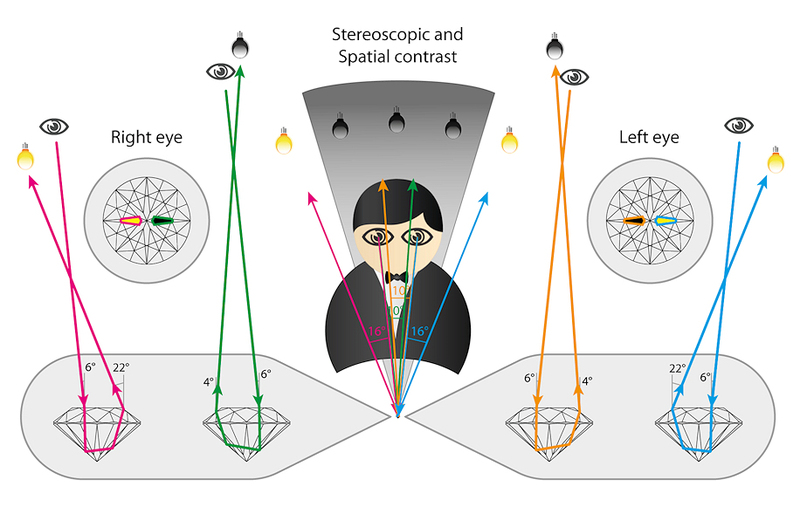 Here’s an illustration to show what happens when you view a stone – each eye actually see’s a slightly angled view of the stone, and then both images are merged in your brain for the final single image of what you see. This btw also clarifies one reason people often say their camera (or monoscopic) photos and videos don’t reflect how it appears in ‘real life’ or stereo vision. The merging of different fire/brilliance in each eye at the same point on the stone are what creates a lot of the sparkle and thus why it can be so hard, if not impossible, to replicate what you really see in person with a single eye camera. Since we want to ensure the Soaring Hearts is the Ultimate H&A cut, we hired them to perfect the Soaring Hearts H&A using their stereoscopic modeling. Next up was laser testing of the cut prototypes to verify how perfectly TIGER was cutting to the final design. Of interest, we learned that OGI lasers are not nearly as accurate as we would have hoped, and thus had to move to SarinHD lasers to perfect the calibration. Thus, all Soaring Hearts, certed from 10,000,121 and higher, are the new (and stereo optimized) Soaring Hearts cut! There is no future R&D planned at this point as we are confident we have developed the ultimate H&A cut for the Amora, and the focus now is to expand production. Have a great weekend and month and see you end of October!